Audient ASP800 8-Channel Mic Pre. Audient ASP800 8 Channel Mic Pre. Whether youre recording drums or simply need more channels, ASP800 is the perfect tool for expanding your existing interface via ADAT. Its flexible and intuitive feature set will transform your current setup into the complete recording rig, perfectly at home recording both acoustic and electronic instruments. Whether you need to add growl to a bass guitar or make those vocals sparkle, ASP800s revolutionary harmonic generation circuitry has got you covered. Retro Channels 1 & 2 feature two unique variable harmonic COLOUR controls per channel - HMX & IRON. Designed to emulate tones often associated with 1960s tube designs and the coveted transformer zing of British audio in the 1970s, HMX & Iron will add new dimension to your audio by providing warm, sparkly tones. Better still, you can combine them to get anywhere in between! HMX MOSFET DRIVE: Travel back in time with ASP800s very own custom harmonic distortion control. Similar to vintage valve preamplifier designs of the 1960s, HMX provides a sweet, thick tone that will sound incredible on anything from drums to electric guitars. Try it on bass synth, or 808 too! By using discrete MOSFET technology, HMX produces asymmetrical harmonic distortion giving you the option to add richness and body to the pristine tone of the Audient mic preamp, D. Take control of your sound and bring your audio to life, 1960s style. IRON MAGNETIC TRANSFORMER DRIVE: Say hello to Audients BRAND NEW British transformer saturator - IRON. A testament to innovation, IRON uses a custom British transformer with a high voltage MOSFET drive network designed to recreate that sparkly, sounds like a record signature of 1970s recording. With one control that simultaneously alters drive impedance, bass response, high frequency damping, phase shift, magnetic saturation and transient shaping - IRON can instantly add sparkle, growl and so much more with one twist of a knob! It sounds killer on snare, bass, acoustic guitar and anything that needs some extra bite. ASP800 provides you with high performance 118-dB AD converters from Burr Brown, the leaders in converter technology. Quality in the analogue stages of our design comes from years of experience as analogue console designers, and when coupled with outstanding converter technology it enables you to hear audio as its supposed to sound. The importance of converters should never be underestimated. As well as offering you 8 channels of mic pre, ASP800 has two harmonically rich JFET D.
Pristine 118-dB Burr-Brown A-D Converters. Merchandise and packaging MUST be in the same condition as when received. If a specific listing of ours does not include the "make an offer" button, we are then currently not accepting anything less than the BIN price for that particular item. 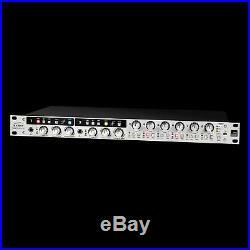 The item "Audient ASP800 8-Channel Mic Pre" is in sale since Tuesday, November 07, 2017. This item is in the category "Musical Instruments & Gear\Pro Audio Equipment\Preamps & Channel Strips". The seller is "altomusicpro" and is located in Middletown, New York. This item can be shipped to United States, Canada, United Kingdom, Denmark, Romania, Slovakia, Bulgaria, Czech republic, Finland, Hungary, Latvia, Lithuania, Malta, Estonia, Australia, Greece, Portugal, Cyprus, Slovenia, Japan, China, Sweden, South Korea, Indonesia, Taiwan, Thailand, Belgium, France, Hong Kong, Ireland, Netherlands, Poland, Spain, Italy, Germany, Austria, Russian federation, Israel, Mexico, New Zealand, Singapore, Switzerland, Norway, Saudi arabia, Ukraine, United arab emirates, Qatar, Kuwait, Bahrain, Croatia, Malaysia.